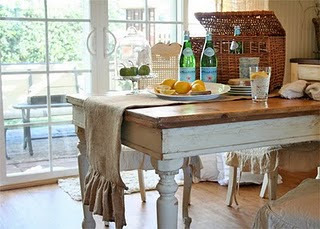 Vintage Home & Garden: old painted cottage giveaway! Jen at The Old Painted Cottage is having a giveaway! 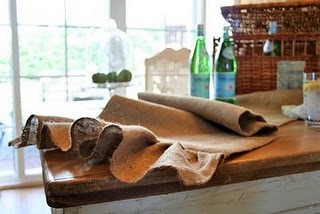 Laurie, from Bella Inspirations has offered one of her gorgeous burlap table runners to one of Jen's lucky readers. Jen's blog is one of my favorites! I have been following her from the very beginning...and it is amazing what that girl can do with a room! I am in love with her kitchen and living room...this girl is amazing! Oh, and she has a little online store, too! Packed with some of the most amazing finds I have ever seen! I want one of everything! She has some serious eye-candy over on her blog, so click over and take a look! But please, try not to drool on your keyboard. So pay a visit to Jen's blog by clicking here and follow her instructions. Thank you, Mary! I'm way behind in my blog rounds. What cute runner! That table is pretty yummy too! Hope you're having a beautiful Thursday. I am sooooo hoping that burlap runner finds its way to my home!!! Hey today is Kenny's birthday!! Wish I was celebrating with him! !